Joyce has created garments for many military films including the recent blockbuster ‘Warhorse’ where balaclavas and mufflers were supplied for all the key actors including Jeremy Irvine and Benedict Cumberbatch. One of Joyce’s mufflers appears on the cover of the DVD of the film. 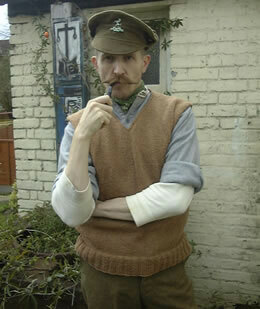 Official hand knitter for the Great War Society [link]. Knitted items from authentic patterns to fit the modern man. Joyce has an extensive stock of original knitting patterns, but these are typically sized for a generation where people were smaller than today – joyce will revise the fit to suit modern body shapes. Joyce has the largest collection of patterns in private hands from this time, including both military and non military such as Home Guard and Civil Defence (Land Girls). Again, these tend to be smaller than today’s body sizes and Joyce will re-size to suit. ‘Empire’ and USA patterns are also included in this collection. In Joyce’s collection there are patterns for military items from 1950 to modern wars. These can be used for other time zone re-enactors as well as museums.